How great does it feel to see someone who has developed and invested so much in themselves that you begin to whisper to yourself, I wish I can become like that person? I wish I can do all that person does? Truth is, you may never become like that person until you have done at least one or more things that person did to get to that stage. There is so much work to be done on ourselves, if we truly must attain greatness and it all starts with you being intentional about it. And while we are all unique individuals possessing distinct abilities, I believe we all have the capacity and possess something deep within us that is capable of pushing and launching us to our destined place. Success is truly intentional and to become all that we are supposed to be, we must continue to grow, develop, and work on ourselves daily to get there. But, a lot of us keeps asking the same question, how do I develop myself into all that I am supposed to be? how do I invest in myself? What can I do to be better? This is why I decided to put up this post to help young people out there who may be asking such questions. Hopefully it inspires you to develop and invest so much in yourself in order to be all that you can ever be. What is your why for living? Why do you do what you do? What are your reasons for existence? What's your major goal in life? What do you hope to achieve before the age of 40?, etc. You must have a vision for your life and write it out otherwise you will fit into someone else's vision which is still quiet okay. But, I greatly believe we were all sent here on earth to do something and it's important to know what your portion is in order to fully become who you are meant to be. There has to be something bigger than yourself that keeps you rooted, so that you can dig deeper and blossom. If you don't have a vision or written out plan for your life, it's likely you don't know where you are headed and if you don't know, it's uncertain to know what areas of your life you will need to develop or work on. I think it's safe to say we have all been there, i.e. being preoccupied with so many things that we sometimes forget what matters the most. Some days it feels like we need an entire army to help us get all of our massive work done and other days we seem lost but there is only so much we can do. Focus on what matters and give it your best. The best thing to do when faced with such scenario's is to first understand your strength and your weakness, then focus on your strength and on what matters the most to you. Know that you can't be everywhere and doing everything all at the same time, know your limits and boundaries. Get yourself centered on what matters the most, do what matters more to you and if you have any spare time left, then you can involve yourself in doing other things. Reading is one of the fastest and easiest ways to develop and invest in yourself. It's one of the surest ways of attaining success, you learn and also discover new things. Try to read books, podcasts, blogs, articles, etc. Schedule time on your calendar to read, take some time out during the week to read, stay up to date on everything that's happening in your industry. It keeps your brain at an alert and your creativity alive. And these days it's been made easier for us, you can listen to audio books while you work, do house chores, or while on the move. One of the greatest habits to form if you really want to grow is to be teachable. You can't possibly know everything in the whole universe, which is why you must humble yourself and learn all that it is to learn. What's the skill you have been dying to learn? What's something you think if you know, can give you an edge in your career or business? How can you be better in your field or area of specialization? Go out there and do something, find out what others are doing that you don't know. For me, I had to take online courses and be coached by someone on areas I really needed to know and improve on. I love to learn new things and practicalize them, learning never ends you know! How easy it is, to not have to go through the hurdles and stresss of getting some things done because someone else has gone through the same thing and simplified the whole process for you. That's what a mentor or a coach does! Look out for people who have gone ahead of you or are into what you are doing or that which you hope to be doing and learn from them, follow their guidelines or steps and you will see that you are closer than you ever think. Easier said than done right? Well, with an unstable and ever changing economy, we can no longer rely on a single stream of income to pay our bills and sort out our enormous needs. We need to create multiple streams of income (earning money from different avenues) to aid us and help us have more control of money in our hands. If you must truly become financially stable, then it's important to do this. And how do you create multiple streams of income? The easiest way is to discover and unlock great postentials within you or find out what you are passionate about and pursue it diligently. What can you do now that your future self will thank you for? It could be learning how to save or manage your money, it could be investing in your relationships, it could be starting that business you have always had in mind, it could be pursuing your Master's degree, it could be ensuring you stay healthy and fit, it could be volunteering for a cause, it could be starting your own journey towards financial freedom, etc. You need to start thinking of your future NOW! Don't wait till you are 25 or 40, start something NOW! See related post: 7 Investments You Should Be Making In Your 20's. What has helped to develop and improve you in the last one year? Kindly share below! Naomi this is gold! We so often invest in others without knowing it and we have to be intentional about investing in ourselves just as much, if not more so. And I love that T. D. Jakes quote! Sacrifice and success go hand-in-hand! awesome... just what I need. thanks!! These points are true and really empowering. 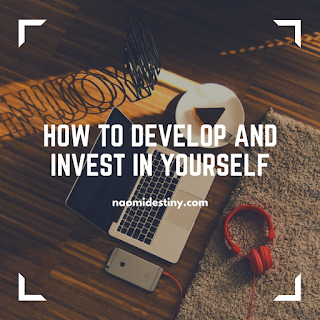 It is indeed very important to invest in ourselves. Will have to check these book out,sounda interesting,thank you for thw tips. This is exactly what I needed to read right now! all of these are great ideas - you MUST invest in yourself to have any kind of success anywhere in life. if you aren't happy, then no one else in your life will be! Great info! Especially the suggestion to read more. I used to read all of the time, and my busy life took over. Need to expand my library soon. Thanks! Chasing Your Dreams: Dreaming Vs Doing!